They’re gonna need a bigger boat or something. 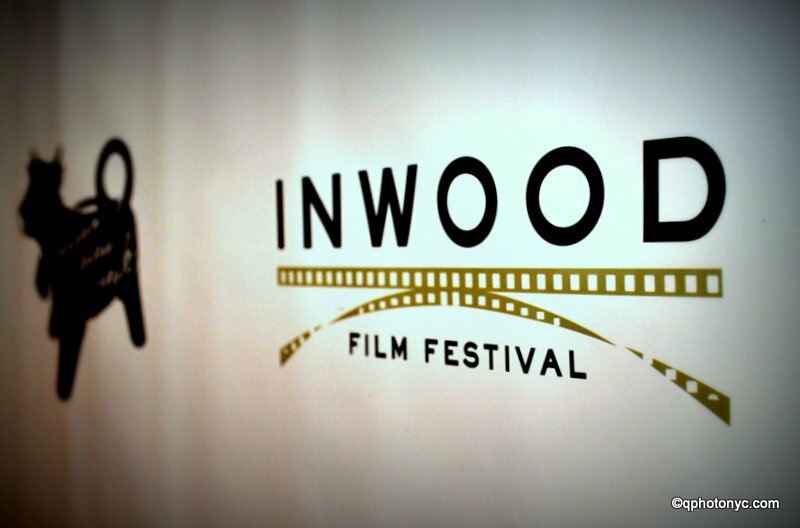 The 4th Annual Inwood Film Festival sold out again this year. More than a thousand film aficionados came up to Columbia Uni’s Campbell Sports Center over the Friday and Saturday programs to watch some or all of the 33 Inwood-connected movies. All of the films were made by local artists, shot up here, or otherwise closely linked to our community. Screenings were categorized by length & genre, with short-shorts, long-shorts, docs, and features among the choices. The $50 Festival Pass was a terrific bargain for bingers who didn’t want to miss anything and they sold out quickly. The quality of the films this year was excellent and several sported the SAG/AFTRA logos in the credits. On both nights viewers were invited to mingle with the actors and filmmakers at Indian Road Cafe after the last screening. The Festival was once again produced by Inwood Art Works Director Aaron Simms, who MC’d the screenings as well. In addition to an outstanding selection of movies there were two seminars where you could learn about film scores and writing for film and TV from a panel of professionals. The movies in the short shorts (<5 minutes) category ranged from Alison Loeb’s delightful Everybody’s Got Something to Miguel Medina’s tender father/son vignette, From Dad to Bobby. Michael Pizzano offered up a pointed PSA for pedestrians, Say No To Drift Walking and Our Picture by Mike Castro had the hall in stitches. Long shorts (<25 minutes) included Katie Kemerer’s Quiet Sundays, a doc about a quartet of European NFL superfans and Savino, Carla Franchesca’s portrait of a portrait photographer who works with a large format film rig. Christopher Ming Ryan’s Disappearing NYC hit the bullseye in documenting the loss of our neighborhood’s small businesses – hammered by relentlessly rising rents, changing consumer habits, and/or technology. This topic couldn’t have been any more relevant to our community as residents bear witness to one venerable local retailer after another vanishing from our lives. The Brothers Molina drops viewers into the world of two siblings who see things quite differently. The performances are super strong and Director Jamie Canobbio absolutely hits it out of the park with this movie. La EntreViú, directed by Maite Bonilla, is a jewel of a film that arrived right on time. It stands in contrast to the fear and loathing toward immigrants that the current admin relentlessly stokes. Friday night’s program closed with Revolution Selfie, Steven De Castro’s gutsy documentary on the New People’s Army in the Philippines. The NPA was named a Foreign Terrorist Organization by the U.S. State Department so De Castro took a great risk from both our own government and that of the Philippines in making this movie. That he was able to make contact with and sell the idea to the NPA was in itself a major accomplishment but the film goes much further. Without crossing the line of promoting or recruiting for the NPA, which would be illegal, De Castro conveys a sense of why they fight.